Long days at the office = no time to blog. My internship ends next week, so the two-week window before school will essentially be planned around b,l,d; I trust other things will fall into place. 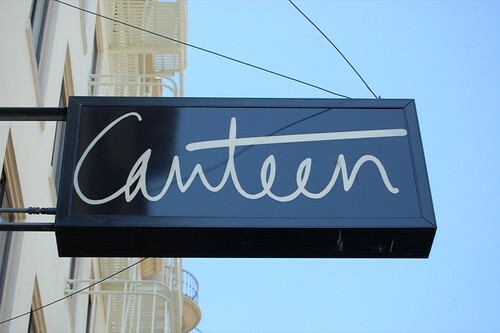 So, last weekend during Global Warming '06, I finally made it over to Canteen, which has had many a diner clamoring for one of its precious 20 seats. I had been anticipating trying ex-Rubicon-chef Dennis Leary's creations for some time, so I decided to drop in for some brunch. We landed a great parking spot, and were seated within minutes. 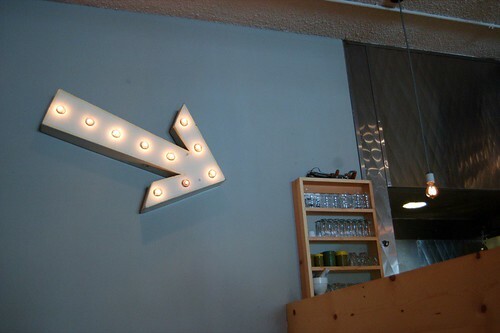 Canteen is situated in the Commodore Hotel, Joie de Vivre's boutique hotel. The decor is gentrified diner-esque, and the wall to the left houses a nice selection of books. I noticed the curly-locked Leary has a love for Joyce: Portrait of the Artist as a Young Man, one of my favorite books ever. While most would consider the restaurant cozy and warm, I found it tastefully unsettling; maybe it was the unnerving music, but I just kept thinking the space would really facilitate shady dealings. I liked it already. Everything on the menu looked pretty appealing, but as a party of two, we wouldn't have the capacity to try everything. The french toast v. pancake was a tough one, but I guess you can't really go wrong with either. The toast was delicious--nicely carmelized and not greasy at all. 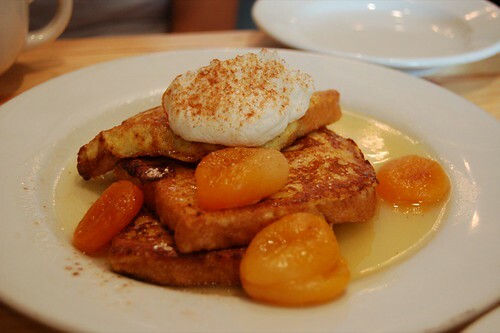 The cooked apricots were fresh and plump, and their juice lended itself to be a great not-too-sweet syrup-replacement. The only things missing were almonds; I couldn't see nor taste them. 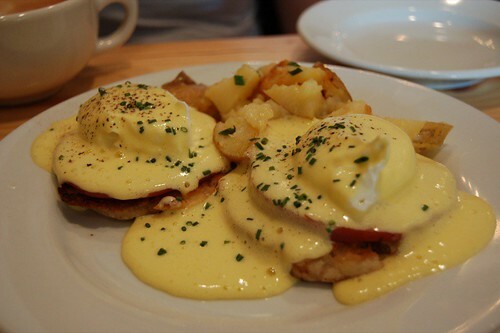 I've been craving eggs benny for a while, and Canteen's rendition really hit the spot. The muffins were nicely browned and crispy, the ham was flavorful, and the eggs were perfectly poached. 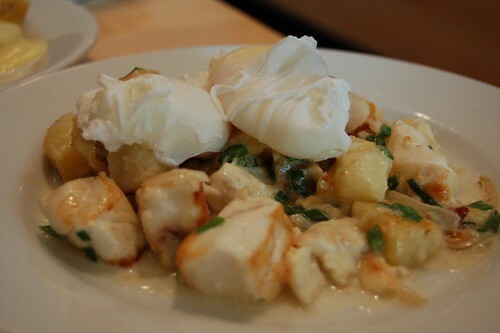 The standout was the hollandaise, which was rich but delicate. This was the most disappointing thing we ordered. The sauce was creamy and flavorful, with a nice touch of curry and onions. 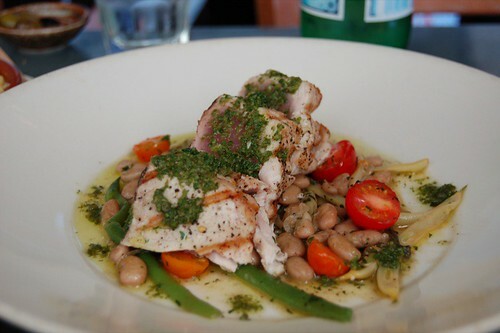 However, the halibut was dry and a bit tough; that said, we ended up leaving most of the fish on the plate. Overall, I really enjoyed my Canteen brunch; I'll definitely be back for lunch and/or dinner before school starts. 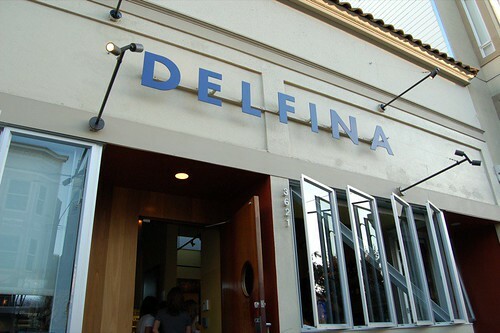 So it took me forever and a day to get to Delfina, but now I understand. Amidst all the hype and frenzy for a reservation, I went in with high expectations, and left very whelmed (as opposed to under- or over-). The excellent food, great service, and nice space all contributed to a good meal. 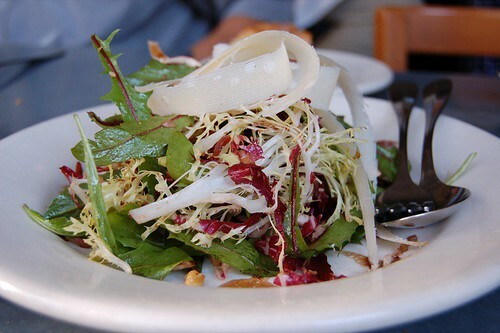 I always prefer my salads very lightly dressed, and this was done perfectly; the ingredients were amazingly fresh and complemented each other. I sure do love those bitter, crunchy greens. 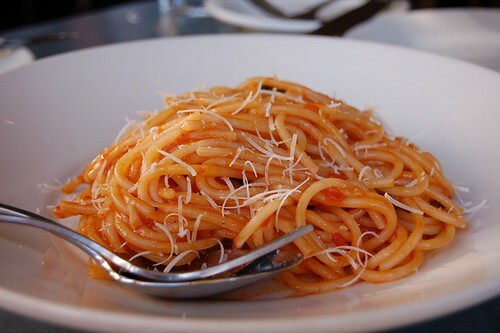 It's amazing how a simple pasta can be so tasty. The sauce was zesty and spicy without being overpowering; the spaghetti was a great al dente. Though it was great, I still maintain that even the best SF pasta can never live up to good Manhattan joints. The fish was delicately grilled and a nice rare in the middle. While the fish was good, the sides were exceptional--amazingly fresh and simply prepared so that the vegetables really tasted like what they should (you can prob tell Delfina does the Chez Panisse thing extremely well). This entree was superb. The lamb was young, tender, and not the least bit gamey. Again, a simple preparation with barely any sauce or garnish, but great ingredients and excellent execution. It has also been a while since I've had peas this fresh; they definitely make up for the lack of spring in Ithaca. Rich and smooth espresso gelato on a crispy pate a choux, though I would've preferred the near-ethereal dough to be a bit more flavorful and buttery. 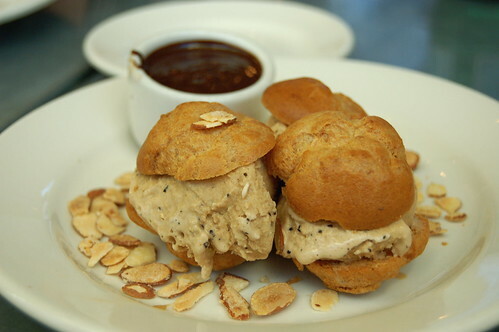 I have to say, though, these might be some of of my favorite profiteroles in the city. 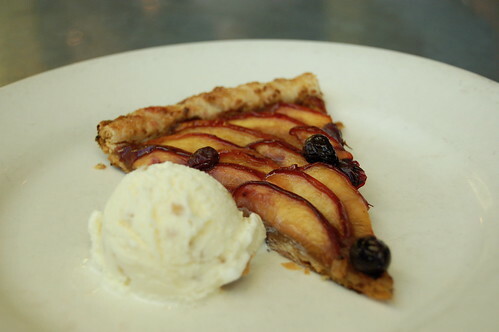 Fresh, not overly glazed fruit arranged artfully on a buttery, flaky crust. What's not to love? There was nothing I disliked in this meal. It was a big peccadillo on my part not to have gone earlier. Continuing on with LA. 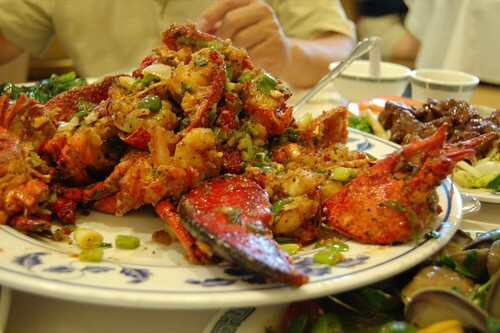 I had been tipped off by a friend that some of the best lobster ever could be find in a legendary but seemingly unassuming Vietnamese-style Chinese restaurant in the San Gabriel Valley. When we arrived, there were around 20 people crowded around the entrance waiting for a table--quite a good sign in my book. After around an hour wait, we were finally seated. In terms of flavor, this was a standard hot and sour soup you could find at a typical Vietnamese restaurant. They were pretty generous with the ingredients, though, and the bowl came brimming with tomatoes, bean sprouts, pineapple, catfish, and bamboo shoots. 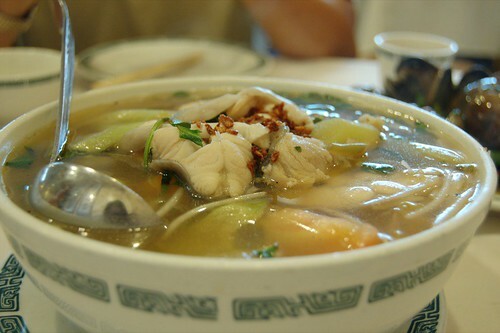 Sour and spicy, this soup really helped to whet the appetite. These were some of the biggest, plumpest clams I've ever had. The sauce was well seasoned with parsley and japaneos, but I found it a bit too thick. 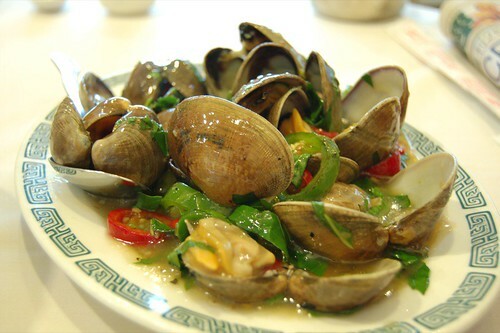 That did not deter me from the clams though; I haven't had clams this huge and fresh in way too long. 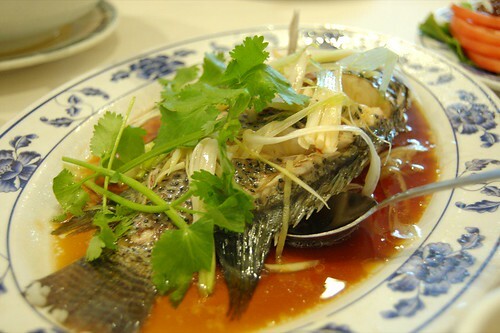 This was a well-executed Chinese-style steamed fish. 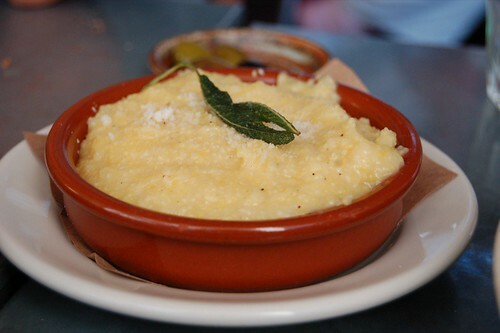 The flesh was perfectly cooked and soft, exhibiting the flavor of the yellow chives, parsley, and ginger piled on top. Delicious. Newport Seafood is well known for their shaking beef, and this definitely lived up to the hype. 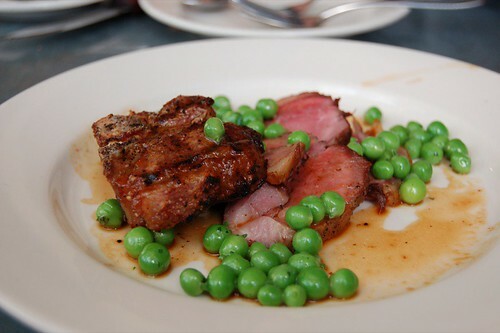 The pieces were tender yet lean and most importantly, a delicate medium-rare. The flavor was excellent--a rich oyster sauce with black pepper. So how does this compare to the Slanted Door? Niman Ranches and organics aside, SD's beef were in bigger, thicker cubed cuts. In addition, they were sauteed with the onions, while Newport kept the beef and the raw onions separate. 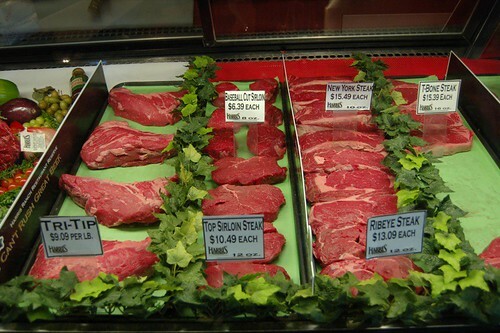 SD's beef also had a cleaner, more citrusy flavor, while Newport's was more rich and intense. I think I prefer Newport's more "down and dirty" version. Arriving on a two-foot long platter, the huge five-pound lobster really stole the show. The pieces were lightly battered and stir-fried in a salty, sour, and slightly-sweet mix of garlic, peppers, and onions. The lobster was incredibly fresh, juicy, and plump (as with all seafood at this place). This lobster preparation was a very welcome change to the sous-vide and butter-poached methods I usually have. In addition, tackling this lobster was fun--in Newport's atmosphere, or lack thereof, most customers are pretty uninhibited, making for one of the tastiest and messiest lobster experiences out there. I'm going to interrupt my Los Angeles posts, since Bastille Day, my favorite of all holidays, came along. Fine, perhaps not my favorite per se, but it's a good excuse for hedonism--not that anyone ever really needs an excuse. 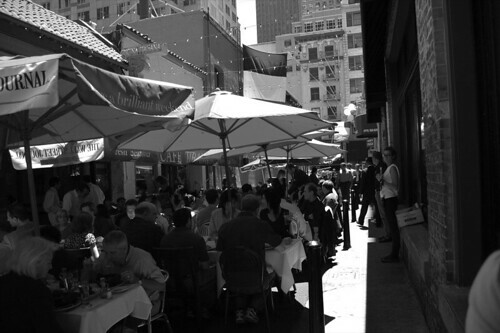 Though I had to go to work, a leisurely 2-hour lunch in Belden Alley provided a good escape from the office. Belden was quite bustling. 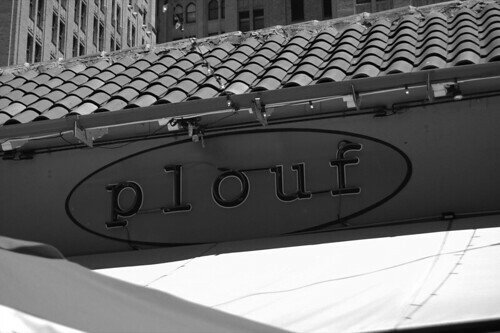 Every restaurant was packed, but Plouf had one of the longer lines. We got some nice seats outside in the breezy, sunny weather. These mussels were deliciously juicy and plump. The broth had a healthy dose of wine, as well as an abundance of garlic. 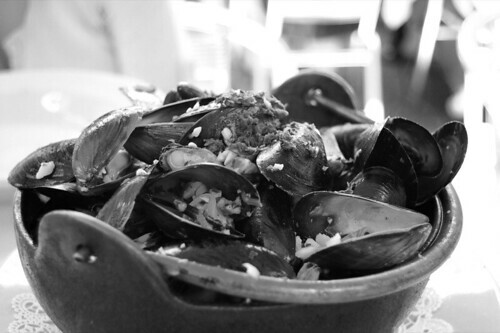 LuLu's mussels are considerably bigger, but Plouf's were more flavorful. However, I still maintain LuLu has perhaps the best mussel preparation in the city, with Plouf coming in pretty close. One problem I found was that once you got to the bottom of the pot, the soaked mussels, albeit more flavorful, had become too cooked and almost chewy. 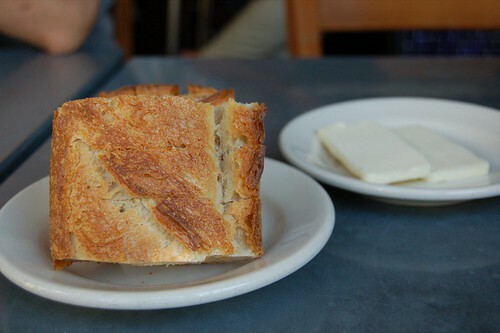 The broth, though, was ambrosia-esque and I soaked up many a drop with the bread. The tart was surprisingly good. 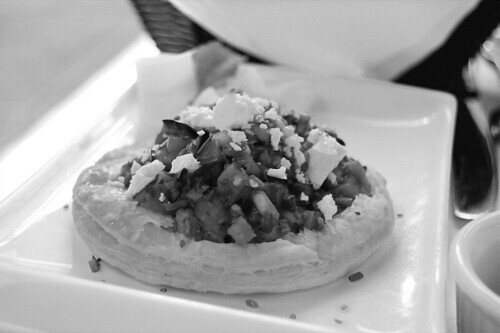 The puff pastry was really crispy and buttery, remaining light and flaky though we waited until the end to eat it. The eggplant salsa atop was light and refreshing, though I couldn't really discern the eggplant. The vinegared cucumber salad was delicious too. Why can't all my lunch breaks be this great? Most of the time, unless I eat with the company, I get a salad or sandwich to go. 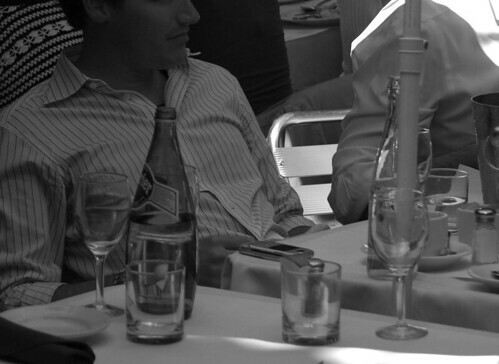 I envy Europeans not only for their fine food, but the way they eat--leisurely and really savoring their food. I am one to eat slowly and to savor every bite, but my one-hour lunch really prohibits a good sit-down experience; a two-hour break would be much preferred. In any case, Happy Bastille Day. Just finishing up some meals from last weekend. 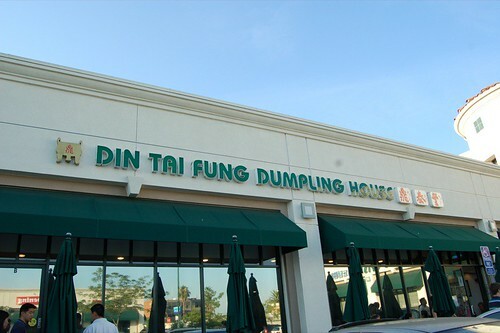 No trip to Los Angeles is complete without a visit to Din Tai Fung Dumpling House in Arcadia. DTF's roots trace back to Taiwan, but has since spawned into Japan and China, both in which it is experiencing immense success; its location in Arcadia, the only outlet in the States, is also having trouble meeting demand. 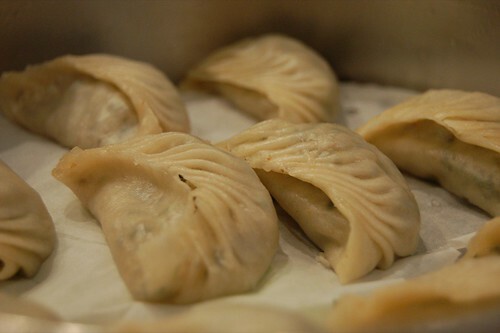 This world famous dumpling restaurant is known for its xiao long bao, or juicy soup dumplings. 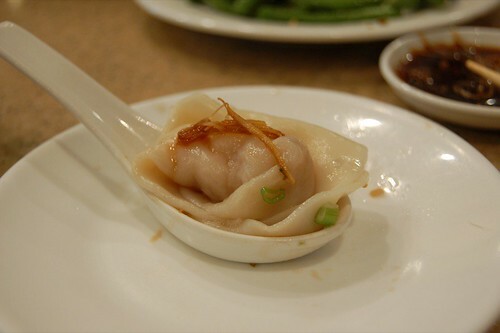 These dumplings' popularity has grown quickly in recent years, as evidenced by the popularity of NYC's New Green Bo and Joe's Shanghai, both of which are absymal, I might add. The line was insanely long, but the restaurant was equally efficient. While it seemed like we would have to wait over an hour in the 95 degree heat, it only turned out to be around 35 minutes. These were wonderfully light. The wrappers were thin with perfect al dente consistency. The stuffing, a stir-fried mixture of finely minced cabbage, vermicelli, and mushrooms, had a clean, subtle (white) peppery flavor. 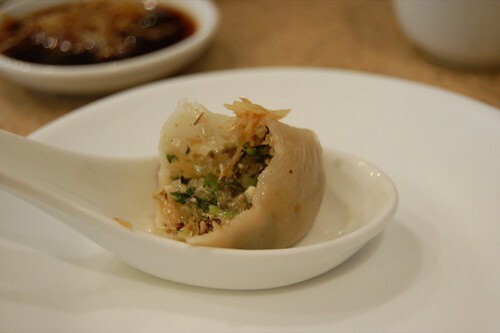 I am usually weary of vegetarian dumplings because they are so bland, but these were great. 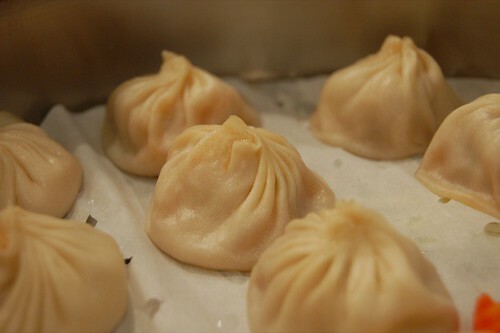 Hailed as some of the best soup dumplings around, these lived up to the hype. The stuffing was quality, with a high ratio of crab meat and roe to pork. The soup, which captured the essence of the crab, was intensely flavorful. Innards aside, it all comes down to the wrapper (and the structural integrity it ensures). I marvel at how the dangerously thin and delicate wrapper amazingly held the meat and soup together. Dip the dumpling in vinegar with some ginger streds, and let the dumpling burst in your mouth. Simply divine. These weren't as good as the soup dumplings, but they were above average. The shrimp was extremely fresh and crisp. Slightly thicker than the other wrappers, the skin was silky smooth. This wasn't the rich, hearty Taiwanese braised beef brisket noodle soup that I expected. 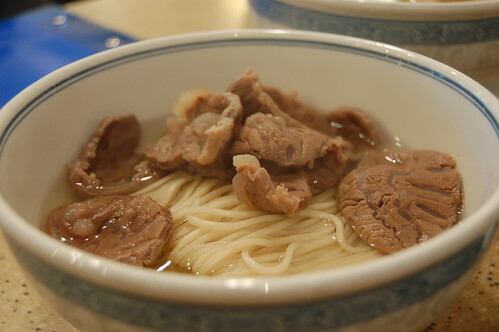 What came out was a bowl of steamed beef tendons served with thin noodles in a very tasteless broth. Medicine Eatstation, anyone? 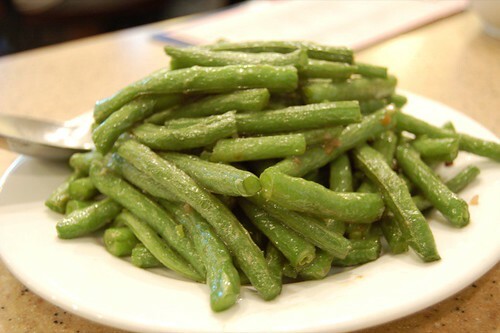 Crunchy, fresh, and garlicky; not too oily. As you can see, making these dumplings is labor intensive. Verdict? World famous for their dumplings, and a damn well deserved reputation. If I didn’t have to work, I’d be on the next plane to NYC for Restaurant Week. During July 10-14 and 17-21, three-course lunches and dinners at participating restaurants are $24.07 and $35.00, respectively. And for a lot of the places, that is a steal. Since I am posting this after the event has already begun, there will be 16 meals to be had, if you take advantage and start with lunch tomorrow. Every meal is an opportunity, so don’t waste them. Yes, I have heard “overrated” attached with some of the restaurants listed above, but I think Restaurant Week is a good chance to check out restaurants you had avoided for one reason or another without sacrificing too much. I would, however, check first with their menu items to see if you like what they are offering. But please, do take advantage! I know I would. Over July 4 weekend, I headed down to Los Angeles for two days for some sun and great meals. 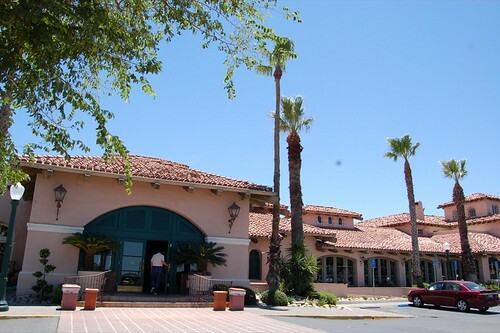 Instead of flying, I opted to drive instead--a decision driven in part to visit the Harris Ranch Steak House in Coalinga, situated about 185 miles from San Francisco. Just four miles from the restaurant is the feedlot for the cattle about to be consumed. You really can't miss the smell driving north. The ranch is quite charming all over. 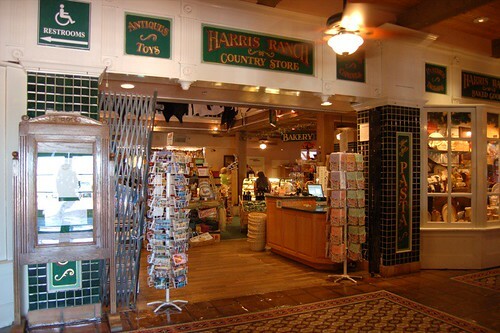 Their gift shop sells some nostalgic American memorabilia, as well as steaks for you to take home. After a short wait, we were finally seated. With various cow raising equipment mounted on the walls, the decor of the dining room was very "Paul Bunyan." 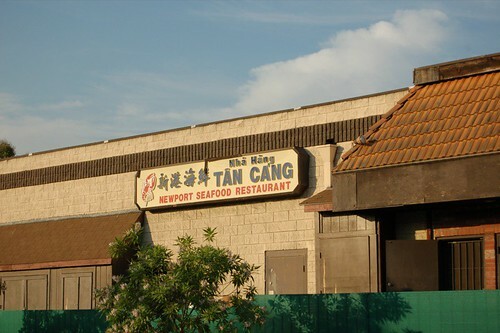 Adding to the beefy ambiance was the clientele, which exuded all the connotations of the average Fresnoan. Anyway, we started off with the salad which comes as part of the steak meals. 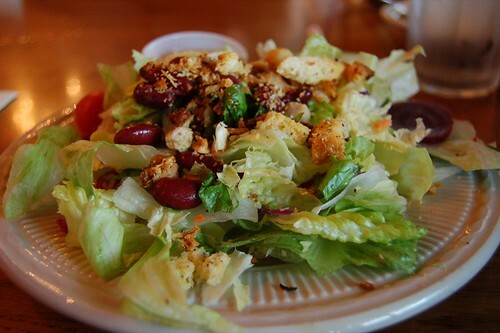 It was the typical steakhouse salad--average iceberg lettuce, canned kidney beans, generic croutons. 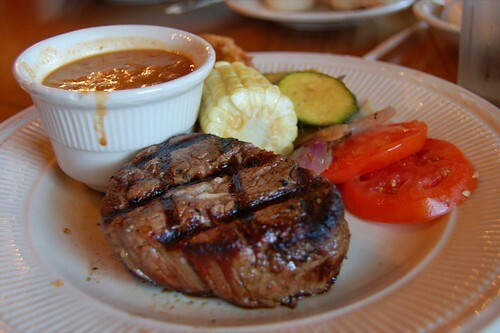 The filet mignon was divine--tender (a knife really wasn't required) and juicy, with the perfect doneness just below medium rare. The meat was bursting with flavor, indicative of the quality of the beef as well as the aging process. I had been craving a good steak for a while (how feminine of me) and this really hit the spot. The sides were alright at best. The grilled vegetables and buttered corn were generic; the side of baked beans was so salty I didn't even touch it. 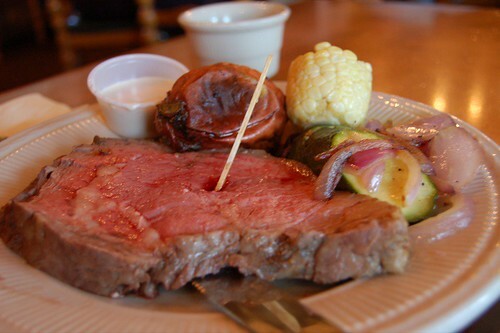 I also got to try a bit of the abundantly marbled prime rib, which was juicy and flavorful. I had initially intended to detox a bit for the weekend after a series of flavor-blasted meals, but the trip to LA effectively ruined that plan. If you find yourself driving on the stretch of road between northern and southern California, do stop here; given the other options in the area, you don't really have a choice, now do you? "uh, you're a 19 year old college student? How can u afford to go out to eat at all these fancy places, and do you realize that most of us out here have to spend most of our money paying rent and other bills? I like your blog but just wish it was a little more realistic- maybe try reviewing a restaurant or two where normal people who don't live off of mommy and daddy's money could eat well. Believe it or not, there are some great places to eat in this city that don't cost $35+ per person." Lucky me and many others to have one of the most fattening and expensive hobbies around. I am passionate about food--passionate enough to lug around my huge camera to take a photo of everything I eat and then talk about it long-windedly on this blog. 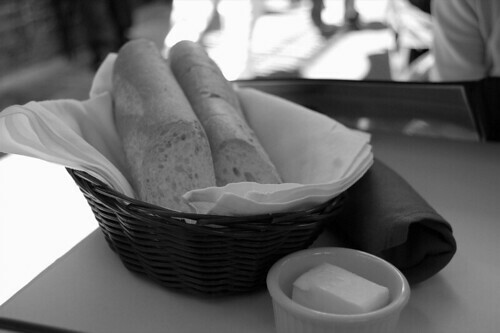 As one of my favorite hobbies, dining out and trying restaurants can end up costing a lot. Do I think it's worth it? Absolutely. Most people end up spending a lot on their favorite hobby, whether it is on a musical instrument or art supplies; I don't feel food is any different. And yes, I am a 19-year-old college student. Perhaps the "typical" college student more "typically" dines on pizza, tacos, and ramen, while my blog seems to tell a different story. I can see how my New York restaurant itinerary comes off as indulgent and downright snobby. But, in fact, I do eat at places that, even as a bottomless pit, I can leave full on a bill in the single digits. While I do appreciate a good value, I try not to let cost hinder me from what or where I want to eat. It just so happens that the restaurants I most enjoy or want to try hover around the upper-middle price range. 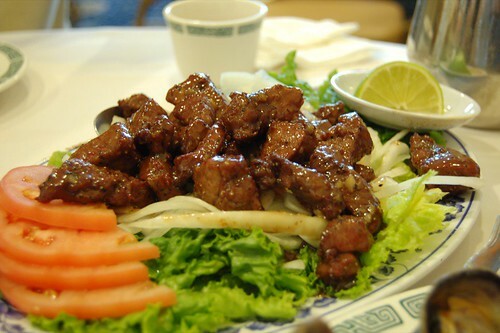 Another factor to consider is that certain cuisines often cost more than others. At the same time, let me reiterate, I do go to places that cost <$35 a person. Every blog is unique. I don't try to cater my blog to the college crowd or the price-sensitive--or anyone, for that matter. This blog is for me to document my meals, as well as to share some of my insight to those interested in my idea of good food. As for "mommy and daddy", I thank them sincerely for supporting this hobby of mine.